You can fight like a ninja in a big way with our Demolition Duo two-piece fantasy fighting daggers featuring sharp stainless steel fantasy blades. Wield them independently or join them together to create a 42"" double-bladed monster spear. The handles are wrapped in black cord with brass-plated hardware for a touch of ninja elegance. Carry them in true ninja fashion in the over-the-shoulder scabbard. Pretty fast shipping, this was a very good buy, it was kind of what ive been looking for, for quite awhile. Scabbard has a good fit, the blades aren't rattling around inside, and it locks in just right, the blades themselves are very awesome, they came adequately sharpened and when combining the blades it locks excellently and with ease. Once again this was a really great buy and im happy with it. 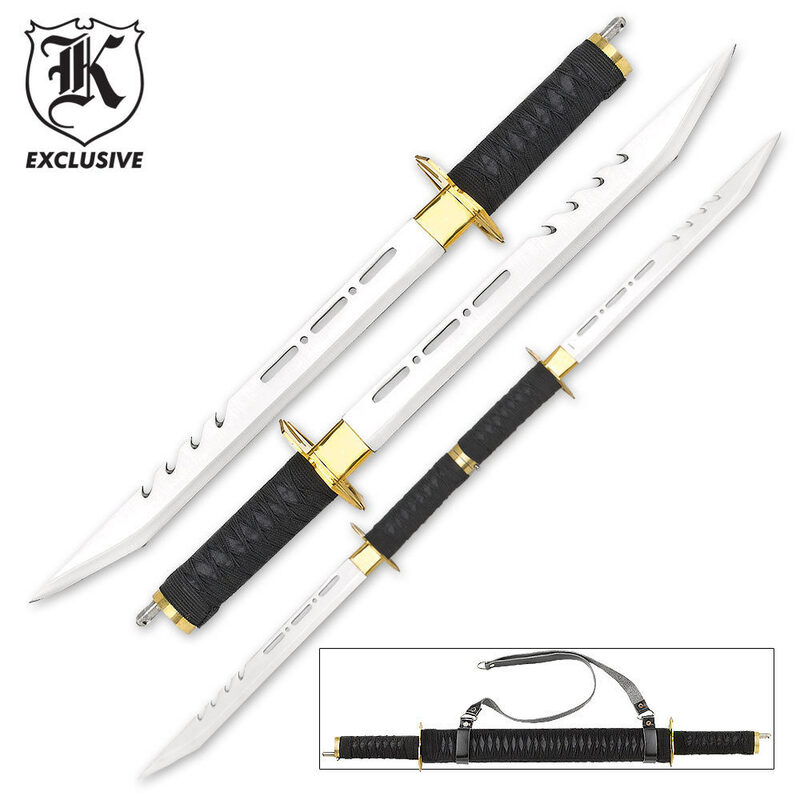 Unlike the twin kodachi which were just two pieces of metal with no edge or any kind of work. So if you are looking for a good duo weapon set I would high recommend this. This swords are alright i guess. The sheath came with some brown powder in it, and the blades aren't sharp at all. if you are going to buy this don't plan to use it.Also the straps on the sheath break very easy. It mine as well not come with a sheath. The blades did not fit into the one that was sent to me. I'm either going to have to trash it or try my best to saw it out more. The straps for the sheath were tattered, and ripped. I guess the quality of the straps didn't matter to anyone if they weren't planning on making a functional sheath...The blades are fine, but overall I was disappointed with my purchase. got this monday and the swords are great except the pieces where the sword connect get in the way if you try flipping it around and the button that disconnects the swords is kinda big. the main thing is the sheath. the straps come apart easily. they're too thin and when i got them the clips were partially rusted. other than the straps its a very good buy.